On 10 January 2017, EUROMIL’s President Emmanuel Jacob spoke at the meeting of the Tripartite Council of the Lithuanian Republic about military trade unionism. EUROMIL had been invited by Kristina Krupaviciené, the Chairperson of the Tripartite Council. At the Tripartite Council in December 2016, the President of EUROMIL’s Lithuanian member association Soldiers Rights Defence Centre (KTGC) expressed the wish to introduce trade union rights in the Lithuanian Armed Forces. Currently, Lithuanian soldiers have the right to join professional associations. An informal contact between the authorities and the associations exists, there is however no formal social dialogue. 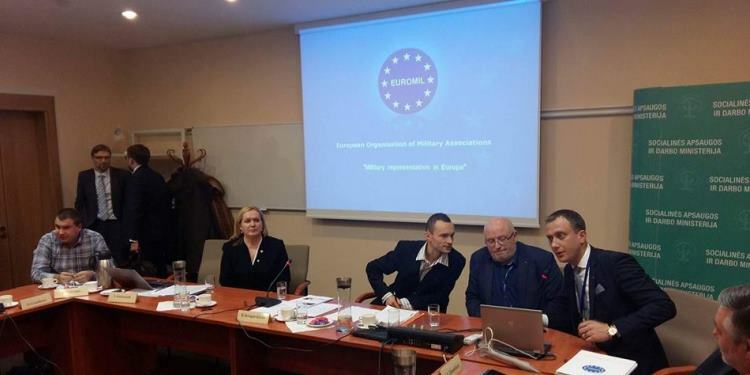 During his presentation, EUROMIL’s President Emmanuel Jacob shared different European experiences in the field of military trade unionism and social dialogue in the armed forces. His presentation was followed by a number of questions and remarks. After several supporting remarks from the trade unions Mrs. Krupaviciené summarized that the issue of military representation should be discussed with all the relevant partners. Representatives of the government and the Ministry of Defence in particular, declared that a kind of social dialogue already exists but that there is a need to guarantee discipline and respect for authorities in the armed forces. “At this point we are your partner” President Jacob reacted. “EUROMIL is in favour of a well-structured and organised social dialogue in benefit of both, military personnel and the armed forces. There is no proof in other countries that trade unionism harms military efficiency and discipline, on the contrary” he concluded.